I was pretty excited to receive this today! 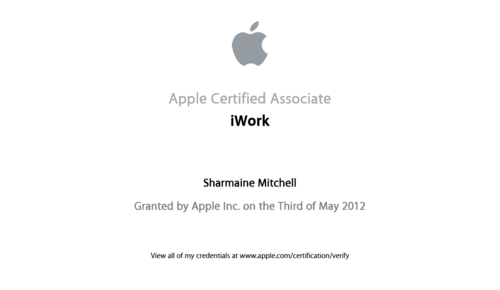 I’m officially an Apple Certified Associate in iWork! From Apple’s website, here are the benefits. The clock ticking down in the corner of the screen during the test, resulting in sweating and shaking, was all worth it! I scored 92.42%! Plus, my boss knew I was taking the test, so I definitely didn’t want to have to tell him that I didn’t pass! How embarrassing would that have been?! ?